Using high-performance aircraft or suborbital spacecraft as launch platforms for upper stages is an idea that’s gaining considerable attention these days. XCOR Aerospace, for example, believes that nanosatellite launches will be a big part of its Lynx business model. Researchers had already gained some limited experience by launching small rockets from high-performance aircraft. Milt Thompson and Forrest Petersen had participated in five launches of Viper I-C sounding rockets from a Lockheed F-104A Starfighter (56-0749). The F-104 carried a hydraulically actuated MB-1 launcher rack equipped with a modified Sidewinder launch rail on thecenterline. The researchers expected that the single-stage Viper could reach 800,000 feet, analtitude comparable to that achieved by the ground-launched Nike-Asp sounding rocket. The F-104 was also equipped with a modified MA-2 low-altitude bombing system (LABS) computer froma North American F-100C Super Sabre that automatically launched the sounding rocket when theF-104 reached the proper altitude and pitch angle. Engineers believed the Viper was sufficiently safe to launch from a manned aircraft, but conducted two flights to verify that the rocket could withstand the stresses of the climb to altitude and thelaunch maneuver. The Air Force conducted the launches over the Pacific Missile Range at Point Mugu, California, at altitudes between 28,600 feet and 51,100 feet, and the rockets attained altitudes between 204,000 feet and 383,000 feet. These tests seemed to confirm that the conceptwas possible. The NACA conceived the basic Scout in 1958 as part of a study into the development of aninexpensive, lightweight vehicle to launch small satellites or perform high-altitude research. NASA assigned the management of the Scout program to Langley, and the vehicle emerged as a four-stage vehicle. Engineers at Langley decided that all four stages would use solid propellants, citing the relative simplicity and reliability of solid-fuel technology. In April 1959, Langley issued the Scout production contract to the Astronautics Division of Ling-Temco-Vought, a subsidiary of the Chance Vought Corporation. The Air Force modified the original NASA Scout under the names Blue Scout I, Blue Scout II, and Blue Scout Junior. Essentially, the North American-Ford study defined a three-stage booster. The NB-52 was the first stage, the X-15 was the second stage, and the upper two stages (stages 3 and 4) of the Blue Scout were called the third stage (despite being two physical stages). The study investigated both guided and unguided versions of the Scout, but concentrated on the unguided vehicle as a means of keeping costs at a minimum. As usual, the NB-52 would launch the X-15 at 45,000 feet, with the research airplane climbing to altitudes between 130,000 and 200,000 feet to launch the Blue Scout. The shutdown of the X-15 engine and ignition of the Blue Scout would occur simultaneously. Ford and North American engineers believed they could reasonably predict the effects of adding an external store to the X-15, and the entire modification would add approximately 500 pounds to the empty weight of the airplane. With the missile pylon mounted on the bottom centerline of the fuselage, a slight reduction in directional stability was expected. However, engineers anticipated that partial deflection of the speed brakes could maintain a level of directional stability comparable to that of the basic aircraft. Lateral stability would suffer from a slightly greater negative dihedral effect, but North American did not expect this to be a cause for concern since it was within the capability of the SAS to counter. The pylon was about the same height as the normal fixed portion of the ventral stabilizer and extended forward to the leading edge of the wing. North American did not expect reentry with the launcher pylon installed to present “any particular problems.” The study estimated that the temperatures on and around the pylon would be less than 1,000°F, and any local hot spots could be tolerated through the use of ablative materials. Before the X-15 pilot could extend the launcher and fire the missile, he had to arm the missile-ignition circuit and the missile destruct system via switches in the cockpit. The launcher was extended and the missile fired by pressing a button on the center stick. Upon activation, the hydraulic actuator unlocked the uplock and extended the launch rail. Shortly before the bottom of the extension stroke the actuator became a snubber, and when it bottomed out it became a draglink. When the extension arms reached 60 degrees arc, the fire circuit for the missile energized and the missile left the launch rails. 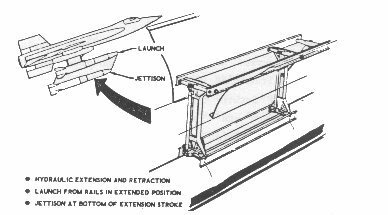 If the missile did not fire, it automatically jettisoned at the bottom of the extension stroke along with the launch rails. During normal operation, the missile de-energized the jettison circuit as it left the launch rails, and the rails automatically retracted into the pylon. The Pacific Missile Range tracked the Blue Scout after launch from an X-15 flying from a lake near Wendover AFB heading west. The expended stages would fall into the Pacific off the coast of California. If the missile had to be destroyed during the first-stage boost, the remains would likely fall on government land along the High Range. Engineers expected that the X-15/Blue Scout configuration could launch 150 pounds into a 115-mile orbit, or 60 pounds into a 1,150-mile orbit. Ford estimated that using the NB-52 and X-15 to launch the Blue Scout could save between $150,000 and $250,000 per mission compared to ground-launching a similar payload. Some figures showed even greater savings. Ford stated, “It is estimated that an orbital mission using the X-15 Recoverable Booster System can be accomplished at a cost of approximately $250,000 as opposed to the $1,000,000 required for an orbital flight of the Scout vehicle. Based on 50 and 100 vehicle launches over a 2-1/2 year period, it is estimated that savings in the order of 12 and 24 million dollars could be achieved. Amortization of vehicle and aircraft modifications and the required development program are reflected in these figures.” This did not completely agree with the assessment made a year or two later by the FRC that each X-15 launch alone costapproximately $600,000. Remembering that 1961 was the height of the Cold War, Ford also pointed out that “[e]xperimental missile launches from the X-15 aircraft in the environment of outer space should provide considerable data toward solving the problem of weapons delivery from a space plane or other orbital vehicle.” Interestingly, NASA also conducted wind-tunnel tests of the X-15/Blue Scout carrying an ASSET research vehicle in support of the Dyna-Soar program. The study also proposed taking the X-15 “on the road” and conducting equatorial launches. The favored scenario apparently had the NB-52 taking off from Cape Canaveral, Florida, and the X-15 landing on Grand Bahama Island. The study continued, “Although it is realized that certain Ground Support Equipment and facilities must be made available for landing and recovery of the X-15 in remote places … the cost of achieving a mission … would be considerably less than required for establishing a missile ground launch site.” This seemed to ignore the fact that there are very few dry-lake landing sites around the equator, especially in the Bahamas. Ford and North American expected that the engineering would take only three months after they were given the authority to proceed, and the manufacture of the launch system and modificationsto the X-15 and NB-52 would take an additional three months. Two development tests (one at Hidden Hills and one at Silver Lake) were conducted seven months after the go-ahead was received. These tests used an unpowered missile to evaluate the captive-carry and jettisoncharacteristics of the configuration. The first test was performed at a relatively low altitude, peaking at 112,000 feet; the second would go to the full 180,000-foot expected launch altitude. When Paul Bikle heard about the proposal, he raised several questions, primarily centering on range-safety aspects in the event of a Blue Scout failure, and the possible impact on the X-15 research program that could result from dedicating an airplane to this concept. It appears that the obstacles were too great for the expected return, and the concept just quietly faded from the scene.